Your teeth are extremely important. They're important for your health, as well as for your self esteem and self-confidence. At Levine-Vaughan Dental we understand that completely. 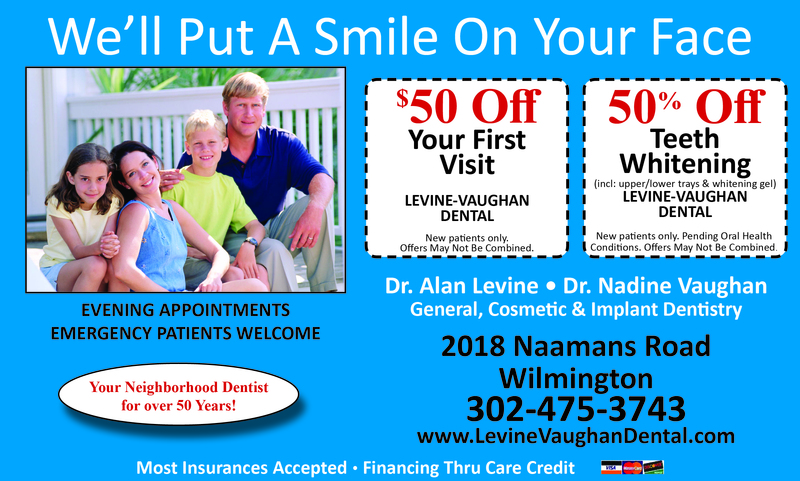 That is why, since 1962 our North Wilmington dental office has taken the utmost care in providing our patients with the highest quality of dental care imaginable. We want you to walk out of here pain free, with a beautiful smile. You shouldn't be afraid to show the world you're pearly whites. As a full-service North Wilmington Dental Office, we provide dental care for children, parents, and grandparents alike. From cosmetic dentistry to pediatric dental care to dental implants, we do it all. The doctors and staff at Levine Vaughan Dental look forward to serving you and your family with a high standard of care. Since 1962, our dentist office has been committed to providing you and your family with the best dental care available. We have families that have been our clients for 4 generations! Monday, 7:30 a.m. – 6:30 p.m.
Tuesday, 7:30 a.m. – 7:00 p.m.
Wednesday, 7:30 a.m. – 6:00 p.m.
Thursday, 7:30 a.m. – 4:30 p.m.